In its heyday, Long Wharf was 1,586 feet in length and 54 feet wide, providing docking facilities for up to 50 vessels. In the 18th century, Boston was the leading colonial port (it would be surpassed by both New York and Philadelphia by the end of the century). Long Wharf was the nucleus of Boston's maritime trade—by the end of the 18th century it reigned pre-eminent among Boston's 80 wharves, handling both international and coastal trade. Its extraordinary length allowed large ships to dock and unload directly into warehouses without the use of small boats. Because the wharf served private merchants and the public, who could buy directly from the warehouses and stores on the wharf, it was a marketplace long before the construction of Faneuil Hall (Quincy Market) in the 1820s. In addition to the economic importance of the wharf, it was also associated with the military history of Boston. Among the events that occurred here were the landing of British troops in 1768 to enforce the King's laws and the evacuation of the same troops in March 1776; the landing of a vessel from Philadelphia bringing news of the signing of the Declaration of Independence; and during the Revolution, privateers and blockade runners sailed from Long Wharf and military stores were kept in its warehouses. After the Revolutionary War, trade resumed its dominant position on the wharf. In addition to the ongoing trade with Europe, Boston merchants engaged in trade with China and the East Indies, depositing silks, madras and cashmere in the warehouses of Long Wharf. In 1830, the first locomotive to arrive in America was brought from England and landed at the wharf. After the Civil War, trade declined in Boston and so did the importance of Long Wharf with business shifting from international trade to coastal trade and fishing. In 1871 Captain Lorenzo Baker of Wellfleet, Massachusetts, landed the first cargo of bananas in Boston at Long Wharf. Banana importation would continue at Long Wharf up to World War II. 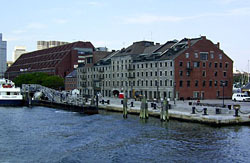 The wharf and the buildings that occupied it necessarily changed over time to meet the needs of Boston's maritime commerce. In addition, infill on the land side of the wharf greatly decreased its length, as did the construction of Old Atlantic Avenue across the west end of Long Wharf and its neighbor to the south Central Wharf. Surviving historic buildings on Long Wharf include the granite block Custom House, which dates from 1848 and the Chart House, which dates from the 1830s and is representative of the earlier form of brick warehouses that occupied the wharf. 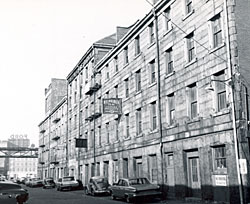 Shortly after construction was completed on the Custom House Block, it was leased to the Federal government for customs work. 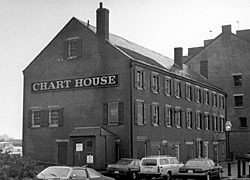 The Chart House was built with large cellars for storing cargo, which was then sold at its doors. Buildings much like it would have lined the north side of Long Wharf from its inception in 1710 until the 19th century.